A 1960s ultramodern home in Cahuilla Hills offers out-of-the-box living. A circular "oculus" opens to sunlight and sky, mirroring the shape of the swimming pool below. Resembling a group of emerald rings nestled in a rock garden, the residence of Nicholas and Carole French sits on a rocky hillside in the Cahuilla Hills neighborhood in south Palm Springs. “We called it Skyfall, as it was very James Bond,” says owner Nicholas French, an internationally known hairstylist who occupies the house with his wife, Carole, when taking a break from his position as the artistic director of Matrix, a division of L’Oréal. The couple purchased the home in early 2014. “We were looking for a house with the ‘wow’ factor, and this was the only one that met our criteria,” he says. Skyfall seems a fitting name for this futuristic house built in 1963 as a spec project by architect R. Denzil Lee, then in his 20s. Designed with circular walls, the unusual structure has the exoticism necessary to be the mountain hideout of some mythical villain in an action thriller. One can easily imagine 007 himself circling the house in a small Learjet. The open oculus draws eyes skyward from the pool deck. “There it is,” says Bond in his Sean Connery incarnation. “It’s the Question Mark House,” adds the famous spy, referring to the unique footprint of the 2,800-square-foot, three-bedroom, three-bath home. The unusual shape of the house was dictated by its irregular building site on a rocky slope, according to the architect. Lee says he was pleased to follow the natural contours of the site because it made the house different from all others in the area. “We did not want a cookie-cutter,” he says of the home. The unique house had an equally unconventional design process. “The developer wanted a round pool in there, and to wrap the house around the pool,” Lee says. Knowing it would be nearly impossible to build the swimming pool inside the courtyard of a finished house, the architect and developer agreed to build the pool first and the house afterward. At that stage, Lee says, he used the center point of the swimming pool as the center of the home’s design. Most of the walls of the house are generated from circles centered on the swimming pool. Alluring views of the Coachella Valley lie beyond the swimming pool. 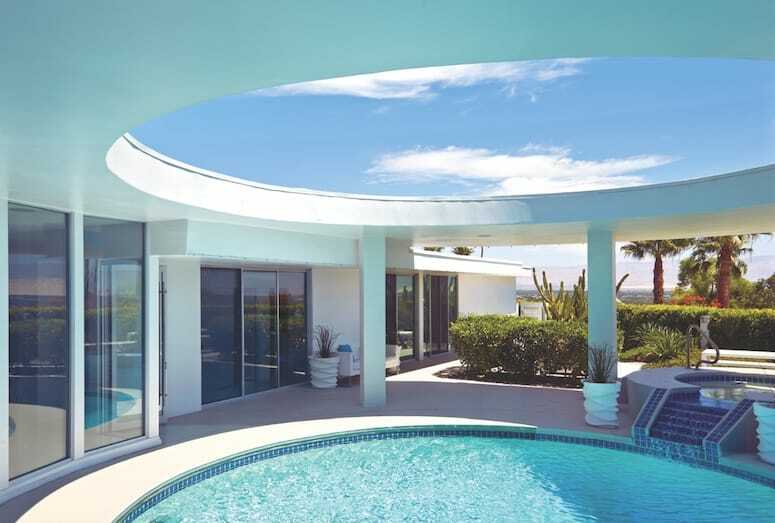 Made of glass, those wraparound walls look onto the circular pool and spa in the foreground, with “stunning 180-degree jetliner views of the valley beyond,” to borrow the phraseology of the leasing agency that rents out the home when the owners are out of town. “One of our guests said the hairs on her arm stood up due to the breathtaking view through the amazing curved-glass windows,” French says. Lee notes that the current entrance is not the original. Previous owners bricked up that one, obliging visitors to walk through a carport and enter the house through a door between the living room and kitchen. “They’ve ruined the entrance,” which was, in contrast, “a pie-shaped entrance, 6 or 7 feet wide, with a frosted-glass door,” the architect says. 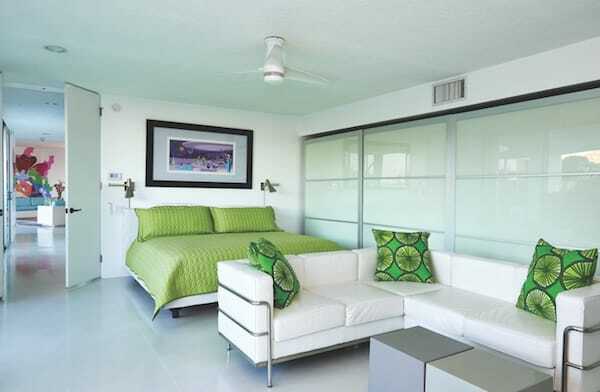 “Once the door was open, you looked directly into the center of the pool.” To the right was the guest bedroom, while “the rest of the house flowed from the left,” Lee says. Homeowners Nicholas and Carole French, in front of a triptych of Nicholas’ hair creations, which he describes as part of his “avant-garde” series. The most notable area in the house, perhaps, is the expansive great room, with its signature curved windows providing unobstructed views of the outdoor living spaces. The great room features three conversational sofas, providing ample space for guests to enjoy a quiet chat or simply take in the hush-inducing surroundings. Anchored by a custom gas fireplace, the room is finished with a period-specific Peter Max–style mural. 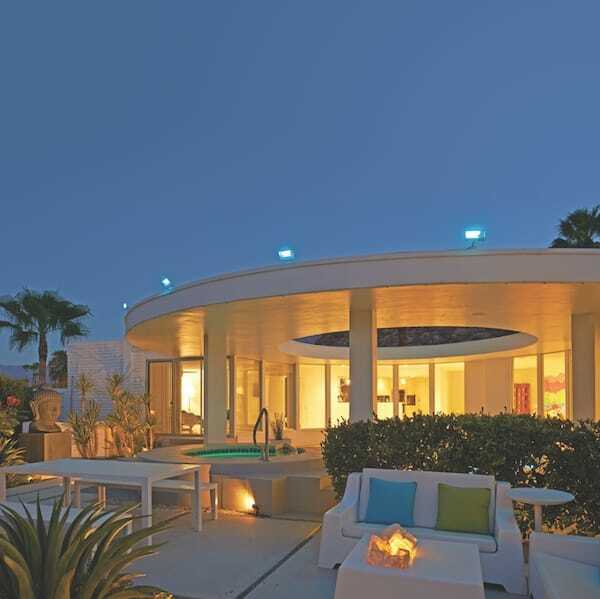 Perfectly suited for the home’s cool, retro-hip “Bond” vibe is a circular opening in the roof that provides a blast of brilliant desert sky at the center of the house. Positioned directly above the circular pool, this opening — the Romans might have called it an “oculus” — enlivens the pool with a beam of sunlight that can resemble a klieg light when the sky is clear. The home maintains its 1960s flavor through carefully chosen accents (the living room mural echoes the works of Peter Max, Milton Glaser, and the Yellow Submarine animated feature) rather than a literal re-creation of period interiors. The interiors are also striking. While the owners have preserved the simplicity provided by a previous owner, French has added dramatic photographs of fashion models wearing his hair designs printed on metal, canvas, and plexiglass. French’s own designs, which are both audacious and meticulously detailed, go well beyond ordinary notions of hairstyling. His work, in fact, seems a good fit for a house with a comparable level of flourish and fantasy. A pair of green pillows with a bold graphic of sliced limes on a guest bedroom sofa is reminiscent of Scandinavian fabric design of the ’60s. The pool area provides a subtle transition that blurs the lines between Skyfall’s interior and the outdoors. Light reflected upward by the pool indirectly illuminates the soffit (exterior ceiling) of the pool area. 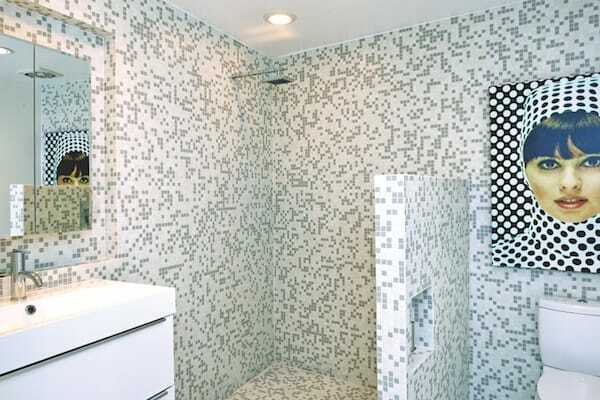 A photo of a Nicholas French hairstyle in the master bath makes witty use of the pulsating black-and-white dot patterns of ’60s-era pop art. 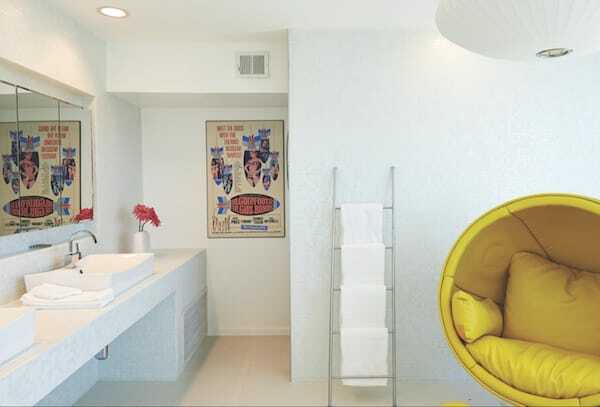 A vintage ’60s womb chair provides a note of repose in a guest bathroom.